On Facebook, Sherri requested a post on the topic of “how to have a food garden for cheap.” I’ll do my best, Sherri! My background in gardening is pretty expansive. 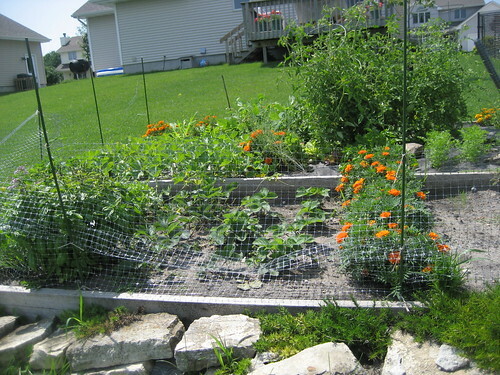 Growing up, my family always had a large vegetable garden, often multiple ones. Planting, watering, weeding, and harvesting from this garden were consistent parts of the spring, summer, and fall during my childhood. We tend to grow herbs, asparagus, and strawberries in the lower portion and vegetables in the upper portion of the garden. The most essential ingredient for inexpensive gardening is a spot of land upon which to put your garden. You don’t necessarily have to own that land; you simply need to have permission to plant there. For example, if you happen to know a family that has a lawn but doesn’t have a garden, you might ask them if they’d be willing to allow you to garden there while sharing some of the produce with them. If you don’t have land, you certainly can still garden, but you’ll be relying on a series of pots and other containers in your house and/or on your balcony for your plants. The easiest way to do this is to patiently wait for sales on the containers (the fall is the best time to do this), hold onto them until the spring, and meanwhile look for sources of inexpensive (read: free) dirt to fill the pots with. I’m lucky to live in Iowa where the soil is fertile. If you don’t have access to good soil, the easiest way to start building up good soil is through composting. Take your vegetable and fruit scraps and keep them in a lidded bucket until they begin to decompose into rich organic matter. Gentle heat (like a warm day), a bit of moisture, and a few scoops of good soil will help the process along. Stop adding new things to the bucket about three months before you want to use the compost. Turn the compost regularly by mixing it up. In my experience, compost made purely of vegetable and fruit scraps doesn’t stink much at all and often acquires a sweet smell when decomposing, though I certainly haven’t made compost out of everything one might use. You can also put coffee grains and well washed and crumbled egg shells into your compost bin. If you’ve decided to garden outside, cultivation can be another challenge. You’re going to have to turn the soil over using some method. The least expensive method is to do it manually with a hoe, but that is very intense labor. Another option is to borrow (preferably) or rent a small tiller that will churn up the soil for you. Buying a tiller can be a cost-effective idea, but only if you’re going to consistently garden a large section of land for many years. Depending on what you’re planting, you may only need a small handheld shovel and/or a hoe. These are often easily borrowed from other gardeners if you know of any. One of the biggest challenges of food today is that almost all of the foods you buy at the store are hybridized, which means that the seeds inside of them are sterile. This means you can’t simply reserve seeds from the plants you wish to grow. There are a few plants you can grow from the remaining portions from a store purchase. For example, we have grown potatoes by taking a potato with several eyes purchased at the store and leaving it in a warm area for a few weeks before planting it. For many plants, however, you’re likely going to be stuck acquiring seeds, at least at first. If you plan on doing this over a number of years, your best bet is to look for non-hybridized seed sources like Seed Savers. The seeds from these fruits and vegetables can be saved for future years of growing – and, more importantly, can be traded with other growers of non-hybridized plants. This means that, while you have a startup cost for seeds, you drastically reduce your continuing cost. One great method, if you’re a beginning gardener, is to get involved in a local gardening club. Check the library and the community bulletin board at city hall in the town(s) nearest you for information on such organizations. A stop at the local gardening store might also point you in the right direction. Not only are such clubs a great source of advice and support (and often a great source for socializing and friendship-building as well), many of the members often grow non-hybridized plants of their own and will trade seeds with members and even give some seeds to new members. My first handful of non-hybridized seeds was from a local gardener who just gave them to me. The best tool a gardener has is education. Read everything you can about the vegetables you’re planning to grow. Wikipedia is a great starting point for this, as are many different online gardening sites. Know when to plant them, how to plant them, and how to care for them. Know how to prevent common diseases. The effort you put into watching the garden, being familiar with the plants, keeping the garden clear of weeds, and taking preventive steps against diseases and pests will pay off tremendously in the quality and quantity of produce you receive at the end of the season. The truth about gardening is that once you’ve taken care of a few startup costs, it really is a very inexpensive hobby that results in delicious produce. However, there is a cost to be paid, and that cost is time. If you don’t appreciate gardening as a hobby, you’ll find it hard to push yourself to do the things that need to be done to maintain a garden, such as weeding and stopping pests. This will drastically reduce the success you see from the garden and reduce the return on your initial investment in seeds and basic equipment.